Soon, many of us will be packing our bags and heading to the famous desert city of Las Vegas. The “Sin City” that has for decades have been attracting gambles to the casinos and fun lovers to the show also attract tens of thousands each year to conventions and trade shows. DEMA, The Diving Equipment & Marketing Association is one of the organizations that will be holding a convention and trade show this year in Las Vegas. Hundreds of exhibitors from around the world will be showing off their products. Equipment manufacturers will be showing off their latest or next products. Dive destinations will be awing you with the experiences they can offer the traveling diver. Attendees will also be coming from around the world. They will be visiting the exhibits and taking part in seminars and training. Everything about this trade show is about scuba diving, however, are you packing your scuba kit? Scuba diving seems to get lost in all the glamour that IS Las Vegas. Face it, Las Vegas is a city that grew in the middle of a desert. As you fly or drive into the city, all you see is miles and miles of sand and barren land. That is unless you happen to be near the Lake Mead National Recreational Area. The Lake Mead National Recreational Area is a highly diverse area managed by the National Park Service. 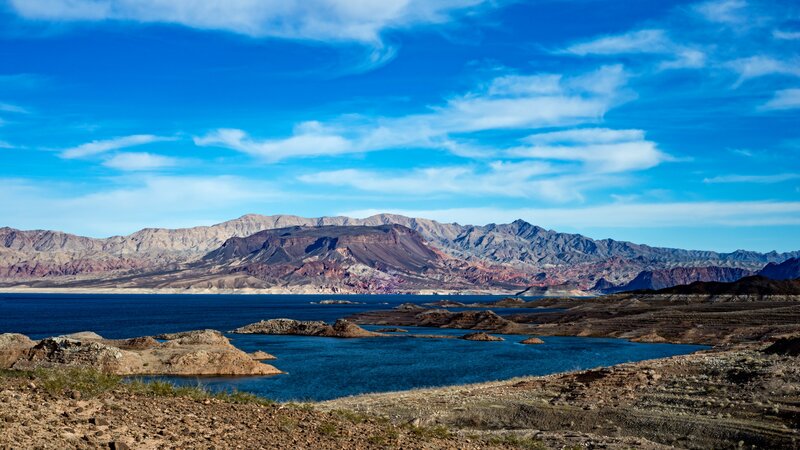 It has 1.5 million acres, that is over 6,000 Square kilometer, The recreational area has nine wilderness areas and two lakes, Lake Mead and Lake Mohave. Both of these lakes were created by dams on the Colorado River. The Hoover Dam created the approximately 110 miles (ca. 177 kilometers) long Lake Mead, while the Davis Dam below the Hoover dam created the narrower 67 miles (ca. 108 km) long Lake Mohave. The two lakes have a surface area of about 200,000 acres or over 810 Square kilometers. Lake Mead National Recreational Area is considered by many as having some of the best freshwater dive sites in the world. When the dam was finished, much of the construction material was left behind. The rising waters covered what was left behind. Some of it is too deep to dive, however, some were on the slopes or other higher ground and can be seen while diving. Equipment is not the only items left behind. Entire towns were also wiped out by rising water. Seventy years ago, On July 21, 1948, a B-29 bomber conducting top-secret test crashed into the lake. Reports indicated that the lake was so smooth the pilot could not judge how close he was to the lake’s surface. The crew survived but the plane was lost. Technical divers found the wreck in 2001 or 2002 keeping it a secret for a while. Archaeologists from the National Park Service Submerged Resources Center surveyed the bomber in June 2003. Most of the survey was done by remote vehicles. A follow-up dive by park divers found signs of looting and the aircraft was put off limits. In 2007, two dive operators were authorized to conduct limited dives, however, at a depth greater than 160 feet (ca. 49 m) there were not many divers. Diving on the site opened again in 2015, however, the drought had lower the water level and now the wreck was within recreational limits. A limited number of divers have dived the aircraft between 2015 and 2017. This year the diving is closed again as the park service reviews the site and its preservation plan. The water is still getting lower and may soon be in less than 100 feet (ca. 30 m) of water. The boulder basin area of the lake is the most popular for scuba diving. Mostly because it is easier to get to, as well as having some outstanding shore diving. The National Park Service has some dive sites listed on the Lake Mead National Recreational Area website and other dive sites listed on Submerged Resources website. Kingman Wash is one of the most popular sites for diving. Located on the Arizona side of Lake Mead it is an outstanding shore dive. There are a couple of different areas to dive here. It has a slope that goes down to 50 feet (ca. 15 m) in places and 100 feet (ca. 30 m) in others. Camping is available here as well. Black Canyon Boulder Basin is a wall dive. The Hoover dam was built across Black Canyon. The area is now flooded and perfect to explore what was once cliffs but can be called walls now. Scuba Beach is a jetty at the north side of Boulder Beach on the Nevada side of the park. Along the jetty is diving from 30 feet (ca. 9 m) to 100 feet (ca. 30 m). The dive sites in Lake Mohave offers something different for many divers. You will find a wider mix of dive sites including some classified as swift water diving. The Davis Dam created Lake Mohave and is located on the Colorado River downstream from the Hoover Dam. The water released from the Hoover Dam is done from the lower portion of the dam, meaning the water is being sourced over 500 feet (ca. 152 m) below the surface of Lake Mead. At this depth, the water is at a constant 55°f temperature. Divers will find that the water temperature in Lake Mohave does not change much from that temperature. Also, the river is narrow in places and some dive sites are known for swift waters. Black Canyon continues below the Hoover Dam. While the upper portion is still considered a part of Lake Mohave, this area is still river-like and is often still consider the Colorado River. 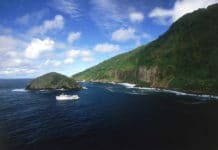 Diving the Black Canyon is an exciting drift dive. The amount of water being released from the Hoover Dam will determine the speed of the drift. Ringbolt Rapids is an exciting drift dive. Prior to the building of the Davis Dam and the creation of Lake Mohave, the Ringbolt Rapids was a dangerous rapid. Today it is a class one rapid. Still, Divers are advised to avoid the Nevada side of the rapids as the area is too dangerous for diving. Depth here can reach 70 feet (ca. 21 meters) and much of the time the river is in control. The site is best dived when the Hoover Dam is discharging at a moderate outflow. A higher outflow will result in conditions beyond any level of safety. This site is best for experienced divers with strong drift dive experience. Upstream from this site is an old work barge that makes an interesting dive. Cabinsite Point (North of Katherine Landing) is a camping area on the Arizona side of the lake. It is a calm area for diving, is done as a shore dive, and has two small wrecks. There is much to offer the diver on a visit to Las Vegas. However, you must remember that you are above sea level and in the mountains. Boulder City is about 1,300 feet (ca. 396 meters) higher than Lake Mead 1,200 feet (ca. 366 meters) elevation and 1,800 feet (ca. 549 meters) higher than Lake Mohave 700 feet (ca. 213 meters). Las Vegas is only 400 feet (ca. 122 meters) lower than Boulder City.